Scroll down to read lots of tasty Paua recipes for you to try at home. To misquote Mrs Beaton, first catch your paua, (or buy them from the local paua farm). Remember with all fish and shellfish - fresh is best. I have heard many stories about the best way to shuck and prepare the paua. â€œYou should shuck them and throw them on to rocks or smash them with a hammer or a rock. I wouldn't recommend either of these unless you are at the beach and want to eat them immediately. Years of experimenting have taught me that it is best to place them whole in the freezer and leave until they are just beginning to freeze, then shuck and clean them. Remove the gut, mouth and epipodium (frill). You can scrub off some of the black pigment if you desire to make them look more like overseas paua. These paua can then be used immediately or replaced in the freezer until needed. Of course if you are preparing farmed paua then you needn't worry about all this, they are naturally tender and require little special treatment. Here is one of my favourite paua recipes; it can be modified depending on your personal tastes and what you have available in your cupboards. Of course if you really want to taste paua at it's best, it should just be sliced finely and sautÃ©ed quickly in a little butter with nothing added. Get your paua (prepared as above) and slice it finely across the foot as you would a mushroom. Slices should be less than 5 mm thick. Place the slices in the marinade, mix around and leave in the fridge for a minimum of 4 hours for the flavours to work through. Saute quickly in a hot pan and serve immediately. Out of the pan or off the barbeque is best. They should have the texture of sauted mushrooms. Do not let them go cold as they will toughen up a little. warm serving plate. Keep warm. juice, toasted almonds, parsley, white wine and salt and pepper to taste. Dip steaks in beaten egg, then shake in a bag with the crumbs. Finely slice the peppers, cheese and avocado. Lay ingredients on paua steak, roll the steak tightly and secure with a wooden toothpick. Bake in uncovered casserole dish 15 minutes at 175C. Serve warm. 4 servings. removed using scissors or knife. To make the omelette, whisk together the egg, palm sugar and fish sauce until the sugar is dissolved. Heat the peanut, and sesame oils in a wok until very hot. Put in half the egg mixture, and spread it to about 10cm diameter. Cook for 30 seconds. To tenderize the paua, place the slices on a firm surface, cover with plastic wrap, and pound each slice firmly with a meat mallet or rolling pin until soft. To make the filling, heat the peanut, and sesame oil, in the wok. Add the garlic, ginger, and chilli and fry for 30 seconds. Add the bok choy and mushrooms and cook for 2 minutes. Add the sauces and stock and cook for 30 seconds. Add the paua and cook for another 30 seconds - not for any longer. Pile on top of the omelettes and serve. Pour milk in a large shallow bowl. In another shallow bowl combine flour seasoned with salt and pepper and corn meal. Melt 1/2 cup butter over moderate heat in a heavy 12 to 14 inch skillet. While the butter is melting, dip each paua steak first into the milk, then the flour mixture so that each piece is well coated. When the butter in the skillet has stopped foaming, quickly saute each steak on each side no more than 15 to 20 seconds per side, until golden brown. Overcooking will cause the paua to be tough. As each steak is sauteed, remove from the skillet and place on a warm platter. When all the steaks are sauteed, sprinkle with lemon juice and parsley. Place platter in a warm oven. In a heavy skillet, melt 1/4 cup butter and saute the almonds over moderate heat for 4 to 6 minutes or until they are golden brown, stirring constantly. Remove the platter from the oven, pour the almonds and butter over the paua and serve at once. Preheat oven to 375F. Grease inside of roasting bag and put it on a heatproof cookie sheet. Using a food processor, blend butter, cilantro, parsley, fenugreek, chives, shallot, black pepper and dried paprika for about 3 minutes using the pulse button. Do not over process. The butter should be speckled with the herbs. Spoon the butter onto a plate and allow to set. Cut butter into 1/4 inch chunks. Set aside. Wash paua fish with water. Place fish inside the roasting bag and top with the dates and chunks of butter. Carefully roll up the bag opening in the direction of the top of the bag to keep in the heat, prevent the juices from leaking and to ensure a good blending of autÃ© is. Bake in the oven for 45 minutes or if using a barbecue, follow the barbecue's manual directions for foil baking fish according to weight. Serve hot garnished with cilantro sprigs, accompanied by a salad. Serves 4. Tenderize whole paua (Pound with 2X4). Place wrap bacon slices around top of paua. Squeeze Lemon juice over paua. 4 whole pauas in the shell. Build a large wood fire on the beach in a rock-lined pit or in a barbeque. Wait until the fire has burned down to bright hot coals, then throw in whole pauas in shells. Test shells periodically with a poker: when they crumble away from the meat, remove them from the fire. This usually takes 45 minutes to an hour. Cut away charred portions, then slice remainder into bite-sized chunks. Dip into soy sauce and eat on the spot. French Baked Paua - Chinese Meal! 1. Grain the paua, scald them in boiling water and drain off the water. 2. Saute the onion grains, move the grains of the sea clam, shrimp meat across the heated oil in a frying pot. 3. In French cuisine, put in butter, peanut butter, coconut milk, and flour to braise them together into the stuffing. 4. Fix the stuffing on the shell of the paua. Coat stirred egg white and yolk on the surface. Bake them in an oven for 10 minutes. When they look golden, place them in a dish. Place the strips of bacon in a shallow pan in the oven at 350 for 5 â€“ 10 minutes to cook off some of the fat; do not allow the bacon to crisp. Remove from oven, drain and let cool. Place a strip of cheese along the edge of each steak and roll the steak around the cheese. Roll a piece of bacon around each steak; cover as much of the exposed steak as possible. Cut off the extra bacon to use on the next steak. Secure the roll with a toothpick. Grill until the bacon is lightly browned and the cheese begins to melt out the ends. Grill plain or with BBQ or grilling sauce. Place hors d'oeuvres on a cutting board, remove the toothpick, slice in half an serve with cocktail toothpics with your choice of chilled white wine or Syrah. Delectable! Place paua shell down on hot grill. Slowly pour small amounts of beer on paua while cooking. Check paua every 5-10 minutes, pouring beer on each time. When the meat of the paua comes free of the shell, cook another 10 minutes. Take off paua of grill and cut into thick slices. Eat with Wasabi and soy sauce mixture. 1. Soak dried oysters, black mushrooms and black moss in water until softened. 2. Remove and with all the other ingredients, place in pot, add enough water to submerge. Boil on medium hear for 3.5 to 4 hours. Heat 1 tablespoon oil in a wok and fry garlic for 10â€“20 seconds. Add in (A) and bring to the boil. Add carrots and broccoli and cook for 2â€“3 minutes then drain. Arrange broccoli and carrots around the platter. Add fatt choy and cook for a minute. Dish out and drain. To the remaining stock add mushrooms and cook for 5 minutes. Dish out and put aside. Arrange fatt choy in the centre of a platter. Heat remaining oil and sautÃ© garlic until golden and fragrant. Add paua, mushrooms and seasoning ingredients. Bring to a quick boil. Add thickening, then pour over the prepared platter. This method of preparing Paua is basically your traditional breaded, fried Paua, but with a nice additional touch. Slice and pound the Paua steaks as described in "Paua Preparation". Definitely put a bit of lemon juice on as you pile up the pieces after pounding. For this recipe, you want to have milk, eggs, spiced bread crumbs, oregano, garlic (crushed or powder), lemon juice, butter and oil (vegetable and/or olive oil). It doesn't hurt to have some extra helping hands as well. Get a cup or other container to mix oil and spices in. Put in about 1/2 cube butter, 2 tablespoons vegetable oil, 2 tablespoons olive oil, lots of garlic and oregano. Heat this in the nuke some to melt the butter and allow the spices to mix in some. This mix is made so that it is real conveniently available when your stove is as hot as you want it. This recipe is like all other Paua dishes, only more so. You want to cook it really hot. Mix up some milk and eggs like it was for scrambled eggs. Put the pounded Paua steaks in this. Use a chopper on the Macadamia Nuts to get them fairly fine, but don't worry about some bigger pieces. They go well after it is cooked. Doris used browned almond pieces so that they would absorb less oil. That was good. Pour some bread crumbs on a plate and put some of the chopped nuts on this. Take the Paua from the egg mix and lay enough to cover the plate of nuts and bread crumbs. Now pour some nuts on top of the steaks and some bread crumbs on top of that. Press them so that they will stick better. Move these to another plate. Put more Paua from the eggs onto the bread and nut plate and cover again as before. What you have done, is made as much of the preparation as possible before starting to cook. This is because with a hot pan and as quickly as Paua cooks, things start to move really fast. Get a good fry pan really hot. Put a couple of teaspoons of the oil and spice mix into the hot pan and follow it quickly with the breaded Paua steaks. Pick up the pan and make the steaks slide around to evenly pick up some oil and heat. Spoon some of the oil and spice mix onto the uncooked side. Cook for about a minute on that side and flip them. Sprinkle some lemon juice on the cooked side. cook for no more than a minute on that side and take them out. It should be nicely browned on both sides. Pull out the nuts that have fallen off. They are really good too. Now while the pan is still really hot, spoon in more of the spiced oil, and do it again. Cooking hot, the Paua should need no more than 1 minute per side. Over cooking will make it quite tough and it won't get tender again for a few minutes. Then it is over cooked and doesn't taste quite as good as it should. Unfortunately, all the care in the world does not guarantee a tender meal. Paua that is tenderized to softness, can toughen up again when cooked, but following these directions will usually produce "fork cutting" tender Paua. It may be Yuppie food, but it is sure good! Partially melt butter in glass bowl in microwave, about 1 to 2 minutes on medium power. Add crushed garlic to butter. Cook butter and garlic for another 1 minute on medium power. Cover bottom of glass dish, such as a pie plate with half of the butter and garlic. Add prepared paua meat. Coat paua with remaining butter and garlic. Cook for 1 to 2 minutes on medium high power. Flip paua and repeat. Do not overcook. The paua meat will become very firm if overcooked. Serve on a plate with lemon wedge. Top with melted butter and garlic. Makes 12. 1. Place the sliced paua into a grinder or food processor and mince. 2. Once minced, place the paua meat in a bowl and add the minced garlic, egg and bread crumbs. 4. Mold the mixture into palm-sized patties and place aside. 5. Heat the oil in a frying pan over medium heat. 6. Place the patties in the pan and cook for about 2 minutes on each side. To Plate: Place paua cakes on a plate and serve. seasoning (salt, pepper, clove or possibly a few drops of balsamic vinegar or orange juice). Note: If only chicken stock is available, caramelize carrots, onions, celery and garlic in a saute pan with 2 TBL butter to add color to braising liquid. Chill short ribs until firm. Cut meat off the bone and cut 4 inch dice. Saute the shallots and ginger in butter for three minutes on medium heat. Add apples and cook for two minutes more. Add short Rib meat and braising liquid and cook until liquid is absorbed but not dry. Add Tarragon. Adjust seasoning. Cool. Select extra Large Paua mushrooms and slice 1/8 inch across the largest section. This will produce 4 â€“ 6 4x3â€ slices. Brush with olive oil and sprinkle with salt. Roast in 350Â°F oven for 10 â€“ 15 minutes until pliable but not dry. Peel beet and slice on meat slicer to thickness of a potato chip. Toss in corn starch. Tap off the excess cornstarch and deep fry at 350Â°F, turning occasionally. Crisp completely but do not brown. Drain. Salt. Reduce the Sherry to 2 Cup. Add CulinArtÃ©' Veal Demi Glace and reduce again to syrup consistency. Adjust seasoning to taste. Keep Warm. Place mushroom on a cutting board. Spoon in 2 TBL stuffing. Roll mushroom closed, and place in half sheet pan with the open edge facing down. Continue rolling cannelloni and press one next to the other to hold them closed and in place. Warm through in a 350Â°F oven. Place Two cannelloni in center of the plate. Toss the baby squash and fava beans in walnut oil. Season with salt and spoon around cannelloni. Sauce around the plate. Garnish with a beet chip between the cannelloni and with an herb sprig or chopped chives. Place the mirin in a small saute pan and heat over very low heat. Ignite it with a fire starter or long match and flambÃ© to burn off the alcohol. Let it cool slightly. Combine the mirin, vinegar, lemon juice and soy sauce in a small bowl and set aside. Place the sliced paua in a strainer over a bowl so that the slices are not overlapping. Slowly pour the boiling water over the paua to quickly cook. The paua should turn whiter. Arrange the paua slices on two plates. Warm the oil in saute pan (do not heat it to smoking) and quickly cook the green onion and ginger slices for about 5 seconds. Season with salt and pepper. Using small tongs or chopsticks, remove the green onions and ginger from the pan and evenly distribute over the paua slices. Drizzle ponzu over the scallion mixture and serve as a simple appetizer with a green salad or as an entree with steamed rice. Pound paua lightly, then slice into thin strips about 1 inch wide and 1 1/2 inches long. Place in a small glass bowl. Mix together lime juice, oil, chili sauce, salt, pepper, garlic, sugar and Tabasco sauce. Pour this mixture over paua and mix well. Cover and chill about 4 hours or overnight. At serving time, spoon into an paua shell or scallop shells and garnish with lime and coriander sprigs. Makes 16.
water in a mortar and pestle (or a blender) until finely ground, not pasty. into large inÂ­ dividual soup bowls. Cut the paua into thin slices. Add pepper, salt, stock and paua liquid in a pan and bring to boil. Add carrot, cauliflower, mushrooms and bok choy. Cook for 5 minutes. Combine cornmeal, thyme, lemon peel, salt and pepper in bowl. Reserve 1 teaspoon seasoning mixture. Heat oil in heavy large nonstick skillet over medium heat. Brush paua on both sides with 1 tablespoon of cream, coat on both sides with seasoning mixture in bowl. Add to skillet and cook until golden browns about 30 seconds on both sides. Transfer paua to shells. Stir lemon juice into same skillet, scraping brown bits. Stir in reserved 1 teaspoon seasoning mixture. Whisk in remaining 5 tablespoons of cream. Boil until slightly thickened about a minute. Season sauce with salt and pepper and spoon over paua. In skillet melt butter and add shallots and garlic until browned. Add sherry to pan and let sherry reduce. Add cream and a pinch of ground black pepper. Place paua into shells. Spoon sherry sauce over each paua and garnish with sprigs of chives. Tenderize paua slices, dip in beaten eggs, then into bread crumbs. Fry paua as usual. After frying place layer of paua in a buttered casserole dish. Then layer of chopped green onion, a layer of chili pepper and a layer of cheese. Repeat until dish is full. Top with bread crumbs and dot with butter. Bake at 350 degrees for 20 to 30 minutes. I use leftover paua it saves alot of steps and a good use for the leftovers. Just layer as above. In a fry pan, saute bacon just until the fat becomes clear do not crisp. Pour off grease. Add onions and garlic and saute until onions become translucent, stirring frequently. Add paua and saute about one minute or until raw paua begins to turn white. Transfer to large pot or sauce pan. Add potatoes, milk and parsley. Bring to serving temperature; do not boil or milk will separate. Salt and pepper to taste. Serve with hot bread, saltines, or oyster crackers. Lightly brown the bacon and pour off all but about 2 tablespoons of the drippings. Add the ablone, potato, onion and garlic. SautÃ© until golden brown. Add the hot water, cover the pan and simmer until the potato is tender. Add the hot milk and butter. Salt and pepper to taste. In a large saucepan, put the oil and butter mix. When mixture is hot, add all of the vegetables and saute them until they are lightly brown. Add the chopped paua and the fish stock, and then bring to the boil. Add the diced potatoes and let the chowder simmer while you prepare the following cream sauce. In a separate saucepan, melt 1/4 cup butter. Add the flour, then blend it in thoroughly. Add salt to taste, a pinch of nutmeg, and cayenne pepper. Let simmer for 2 minutes. Mix the cream and milk together, add to the flour mixture and heat gently, mixing constantly. When smooth, add Sherry. Add this cream sauce to the above simmering chowder. Bring to a quick boil, stirring well. Serve with chunks of French Bread. Dice paua, add to potatoes and let simmer in pot with water. Fry bacon until crisp, drain and set aside. In the bacon fat, cook onion, celery until nearly done. Pieces should be slightly crunchy. Drain and add vegetable and butter to paua. Simmer very slowly, adding a cup of milk every 5 minutes. Salt and pepper to taste. Add cornstarch if thicker chowder is desired. Allow pot to simmer for an additional 15 minutes. Add corn if desired. Soak the dried paua in enough water to cover for two hours. Wash away any sand or grit. Soak again in water and leave in the refrigerator, preferably for two days to plump up. Put soaked paua in one litre water. Bring to a low boil and simmer for 30 minutes. Turn off the flame and cover the pot. Set aside overnight. Discard water and remove the prepared paua for use. Soak fish maw for an hour. Drain then put fish maw, one stalk spring onion, a slice of ginger and half a litre of water to a boil. Cook for five to 10 minutes. Drain, remove fish maw and cut into bite-size pieces. Put chicken and prepared paua pieces in a double boiler. Pour in hot water, cover and double boil over low heat for three hours. Add the fish maw and continue to double boil for a further 40-45 minutes. Add salt to taste and serve hot. In a Dutch oven or frying pan that has a cover, autÃ© the onion, green onion, bell pepper and garlic in oil, about 5 minutes. Add parsley, tomato puree, stewed tomatoes, wine and fish stock or use all water and seasonings. Cover and simmer for 1 hour. Remove the garlic. Scrub the clams or mussels to remove any sand from the shells and arrange them in the bottom of a large pan. Rinse the paua if they have been previously frozen. If you are using prawns cut them down the backs with kitchen scissors, wash out the sand vein; place on top of the clams. If you are using crab, crack the crab and place on top of the clams. Add the cubed fish. Pour on the hot prepared sauce; cover and simmer until the clam shells open, 20 to 30 minutes. Serve in large soup bowls or soup plates, with some of each shellfish in each bowl. Makes about six servings. Sourdough French bread and a green salad are good go well with this. Fry paua quickly in 3 tablespoons butter. Set aside and keep warm. Saute onion in 2 tablespoons butter, add remaining ingredients. Simmer 1/2 hour. Add Paua and stir over low heat until blended. Remove bay leaf; serve over rice. Serves 6. Bread 7 pounds of paua steaks with egg and cracker crumbs; add salt and pepper. Cut into bite sized pieces. Heat 1 cube butter in frying pan; fry pieces until golden brown (about 1 minute on each side). When all pieces are fried, add 1/2 cup cream and 7 teaspoons lemon juice. Cook until cream is all heated (about 30 seconds). Place in chafing dish and provide fondue forks or toothpicks. Slice the hard-boiled eggs in half, remove the yolks and grate. Toast muffins. Make a cream sauce by heating butter in a saucepan until bubbling. Blend in 2 tablespoons flour, 1/4 teaspoon salt, 1/8 teaspoon pepper. Heat 1 cup milk and pour slowly into the butter and flour, stirring until smooth. Mix cream sauce with egg yolk and stir in the grated egg whites. Sauce yields 2 servings. Cut paua into bite-size pieces, place on toasted muffin half and pour the sauce over. Sprinkle with chopped egg yolk. 18 cultured paua, 2-1/2 to 3 inch, see note. 6 shallots, peeled and sliced. 2 cups dry white wine. 8 ounces unsalted butter, cut into small cubes. 3 ounces enoki daki mushrooms, trimmed of stems. 1 large beefsteak tomato, peeled, seeded, diced. 2 tablespoons fresh-plucked dill, lightly chopped. Prepare the paua by running a small spatula between the paua meat and the shell. Remove the intestines and cut off the red mouth parts located on the front edge of the "foot". Place the paua on a rinsed out tea towel. Use a fine tooth meat tenderizer to lightly pound the paua, cover with the towel and pound with the flat edge of the pounder until lightly flattened. Reduce the shallots and white wine in a heavy bottomed-stainless steel sauce pot until almost dry. Add cream and reduce by half. Whisk butter into the cream reduction over medium heat. Strain through a fine mesh strainer. Add enoki daki mushrooms, diced tomatoes and dill. Set aside in a warm place. Season the paua with salt and white pepper then dredge in flour and then beaten eggs. Heat clarified butter in a saute pan and when almost smoking, saute the paua 8-10 seconds on each side. Warm up the sauce and spoon some on the middle of a warm plate. Place three paua on top and garnish with dill sprigs and a cleaned paua shell with golden caviar inside. Note: Large sea scallops may be used instead of paua. Slice them 1/2 inch thick and proceed with the same cooking method. 1) Remove from shell: (see video gallery for a demonstration) Wedge your ab iron underneath the meat on the smaller end of the shell (closest to the holes) and do your best to get between the shell and the meat. It'll take some effort the first few times, but once you get the hang of it, they're a breeze. Peel the gut sack from the shell, and then remove from the ab itself by slicing off. 2) Pound: (see video gallery for a demonstration) Many prefer to clean and slice their abs before this stage, however, pounding whole works extremely well and is the quickest way to dinner. Take the abs to a hard surface, and beat them into submission with your 2x6. (A sidewalk works well as this can make a lot of noise) At first they'll have a tendency to bounce & slide, but after about 20 blows they loosen up to perfection. Don't worry about the exterior, but you don't want to trash the meat. Contrary to popular belief, it is possible to over-pound an paua. 3) Slice: Pancake-style is visually appealing, but can also be very difficult. People who opt for this method typically use a VERY sharp knife, a deli meat slicer, or some kind of jig made specifically for this purpose. I find it easiest to use a decent knife and slice from the top down, (lengthwise) creating strips. I make my slices about 1/4â€. 5) Breading: Grab your three bowls. In the first, dump the flour; the second, whisk the eggs; and in the third, place bread crumbs and any seasonings you may want to add. Now run the assembly line: flour, egg, crumbs. Do this until all of your paua is breaded. 6) Frying: Grab a deep skillet or wok and fill with 2-3 inches of canola oil. Get it really hot, but not smoking. A single drop of water should send the oil into a bubbling, popping frenzy. Once it's up to temperature, drop in the breaded paua and cook â€˜till golden brown. (around 20 seconds depending on oil temp) Remove the fried pieces of paua and place on a bed of paper towels. Repeat this process until all the paua is cooked, creating a new paper towel layer for each batch. Done. Garnish with lemon wedges. Serves 6-10 depending on ab size. *Tip: a large jar and funnel w/strainer is helpful for storing oil for reuse. Avoid cooking them whole. Unless you can thoroughly tenderize them they can be to hard to chew, and they become wasted. Ab over linguine with the sauce poured over the top. I have also powderized Ritz crackers and dipped the Ab in beaten egg then flop it around in the Ritz crumbs and fry it in a little macadamia nut oil and a small amount of butter. The key to remember is to cook it hot and fast. Oh yes, I almost forgot. If you deep fry them try a beer from one of the local micro breweries up here,(Sonoma Mountain no longer brews, damn them!) If you do the italian style I recommend having a good chardonnay with it, preferably from the Alexander Valley in Sonoma County. Also eating them fresh is the best thing. After they are frozen they considerably loose their delicate flavor and texture. If you must freeze, slice and pound and store in a large zip-lock with a little milk in the bag. It will prevent freezer burn and absorb any odor that may develop. One more thing...You must have fun! 1. Follow Lisa's recommendation re crowbarring them out of their shells . 4. Heat on high, 2 T. butter, a little olive oil and 2 cloves crushed garlic in a large, heavy skillet until butter melts. 5. Quickly place paua slices in skillet and cook for approximately 30 seconds. Sprinkle each with freshly squeezed lemon juice, then salt and pepper. Flip slices over. Cook an additional 30 seconds or until barely opaque in color. Special Notes- Believe Lisa's recommendations that: they are difficult to get out of their shells; they cook quickly or you end up with shoe soles; you will remember this for a lifetime (both the preparation and eating!). Enjoy. There is a reason these are considered a delicacy and are quite expensive to purchase in the stores if you can even find them. 1. Take the paua to the back porch (bring large mallet), crowbar them out of their shell, and pound the hell out of them. 2. Get electric frypan good and hot while dredging beaten and subdued paua in milk, egg and flour. *fast*! You don't want an overdone, rubber paua. Fry bacon. Add oil to the drippings. Cook celery and onion, then add mushrooms and green pepper. Cook for 5 minutes. Add rice and sliced paua. Stir fry. Serve warm. Mix together the paua, eggs, milk, baking powder, salt, a dash of Worcestershire sauce and a grating of nutmeg. Heat the fat to 375 degrees and drop the mixture into it by spoonfuls. Cook the fritters until lightly browned - about 2 minutes. Serve with lemon wedges. What's nice is that you don't have to tenderize the paua before cooking, because it is ground. Cube paua. Put into food processor. Process until well ground. Remove paua. Add scallops to processor and grind well. Combine paua, scallops, egg and salt. Shape into flat patties. In a skillet, heat oil and butter. Dip patties in flour. Shake off excess. Fry quickly, a minute or less, per side. If desired, serve with lemon slices. *Fresh paua and sea cucumber can be purchased at seafood markets and also at larger suburban fishmongers. 1. Put the paua into the refrigerator for 10-15 minutes to 'put it to sleep'. This will make it easier to remove from the shell. When chilled, lift it out of the shell with a very strong, thin, steel-bladed knife. Carefully cut and lever between the flesh and the shell, making sure not to pierce the flesh as it gives a bad taste. Remove the intestines from the flesh very carefully, too. 2. Slice the sea cucumber and paua very thinly. 3. Heat wok to a high heat, then add the oil. Add all the cloves of garlic and stir fry for a few minutes. 4. Add spring onion, and then add the sea cucumber, chicken stock, soya sauce, carrots, vinegar, rice wine and sugar. Stir through the paua last. Cook for only a minute. 5. Mix cornflour with a little cold water, then stir through the mixture. 7. Remove from heat and serve with rice or noodles. Slice paua very thinly across the muscle Layer paua slices, finely chopped garlic and chili in bowl Squeeze lemon/lime juice over.Refrigerate for at least 1 hour. Serve on lettuce leaves as an entree, sprinkled with freshly ground pepper. Great with chilled white wine and crusty bread. Taking the paua slices out of the marinade one at a time, sprinkle spice mixture on both sides of each slice, place between 2 sheets of wax paper, and pound spices into each slice. Place slices on a cookie sheet and bake for 2-3 hours at 200 degrees. Heat the oil in a large frying pan until hot. Coat the steaks lightly with flour. Fry the steaks in oil until golden brown on both sides. Remove and blot excess oil on paper towels and keep warm. In a bowl, combine the water and cornstarch and mix until well blended. Stir in the lemon peel, lemon juice, sugar and salt. Cook over medium heat until thickened, stirring constantly. Add the parsley and butter, stirring until the butter is melted. Pour this sauce over the paua steaks. Serves 4. Slice one end off of each lemon and save the end. Scoop out the pulp. If the lemon will not stand upright, with the open end up, cut a thin slice off the other end to level it. Peel the cucumber and chop it coarsely. Combine the diced paua and cucumber with the grated radish, rice vinegar, sugar and soy sauce. Season with salt. Toss well, then stuff into the lemons. Cover them with their lids and serve on small saucers. Serves 6. 1. Drain cooked paua and save the liquid. 4. Heat the oil in a wok or large heavy frypan. 5. Stirfry the garlic, ginger and pepper flakes in the hot oil for about 60 seconds. 7. Add light soya sauce, rice wine, sugar, tomato paste, stir well and bring to a boil. 8. Reduce heat, then add bean curd and lettuce, stir well. 11. Sprinkle the scallion onto the dish, then serve immediately. Serves 4. In skillet sautÃ© diced onion, carrots until soft. Add coconut cream; lime leaf or juice, curry paste, currants, lemon grass and cilantro. Simmer for 20 minutes. Fold in mayonnaise. Prepare paua into medallions then slice into four square pieces. Remove lime leaf and lemongrass from sauce. Preheat oven to 325 degrees. Place wonton squares on work surface, brush lightly with vegetable oil. Press each wonton into miniature muffin cup, oiled side down. Bake until golden brown. (About 8 minutes). Cool completely in tins. Remove cups from tins and store in airtight containers at room temperature. 1.Drain the cooked paua and save the liquid. 2.Cut the vacuum-packed cooked paua into strips or thin slices. 3.Mix the saved liquid together with all the other ingredients, pour onto the paua and toss well. 4.Cover and refrigerate for an hour. 1. Drain canned paua (reserve liquid for soup). Slice thin or cut in strips. 2. Combine soy sauce, wine vinegar, sugar and sesame oil. Mix well, then pour over paua and toss. 3. Refrigerate, covered, 1 hour. VARIATIONS: Cut paua in 3/4-inch cubes. Marinate 15 minutes in a mixture of 1/4 cup of its own liquid, 2 teaspoons soy sauce and 1 teaspoon peanut oil. Sprinkle lightly with pepper and serve on toothpicks. Use half a can of paua and add 1 Cup celery. hearts or tender stalks, slivered. In step 2, make the dressing with 1 tablespoon soy sauce, 1 teaspoon sugar, 1/2 teaspoon salt and a few drops of sesame oil. Toss, then refrigerate only 30 minutes. Use half a can of paua and add 2 Cucumbers, peeled and either sliced or cut in strips. In step 2, make the dressing with 1 tablespoon soy sauce and 1 teaspoon sesame oil. Toss, then refrigerate only 30 minutes. Partially melt butter in glass bowl in microwave, about 1-2 minutes on medium power. Add crushed garlic to butter. Cook butter and garlic for another 1 minute on medium power. Cover bottom of glass dish (such as a pie plate) with half of the butter and garlic. Add prepared paua meat. Coat paua with remaining butter and garlic. Cook for 1-2 minutes on medium-high power. Flip paua and repeat. Do not overcook. Serve on a plate with lemon wedge. Top with melted butter and garlic. Trim the paua, removing rough parts, and cut into flat rounds. Chop shrimp and fat pork to a paste consistency; stir in the water chestnuts, chives and ginger water. Season with salt and MSG. Create the paua â€œsandwichesâ€ by spreading an paua round with shrimp paste, then topping with another round. Dredge â€œsandwichesâ€ in maize flour and set aside. Heat chive and ginger oil in a wok over medium heat, swirling the oil to coat all sides of the wok. Dip the paua â€œsandwichesâ€ in the flour, then in eggs. Fry in the hot oil until paua is tender and golden. Add Shaoxing wine, chicken stock, salt and MSG. Bring to a simmer, adjust the seasonings and simmer for 3 to 4 minutes. Serve immediately. Ginger water is available in Chinese markets. This recipe will make about 1 cup. Prepare sauce before cooking the paua. 1. In a small, heavy-bottomed saucepan, combine shallots, vinegar and wine. Bring to a boil, reduce heat to medium, and simmer mixture, uncovered, until liquid is reduced to about 2 tablespoons. 2. Whisk in cream and reduce heat to low. Simmer mixture, whisking occasionally, until liquid is reduced to about 3 tablespoons. 3. Add one cube of butter, whisking constantly. When butter is nearly blended in, add another cube, stirring constantly. When butter is nearly blended in, add another cube, still whisking. Continue adding one cube at a time, whisking constantly. The sauce should be pleasantly warm and should thicken. If it becomes too hot and drips of melted butter appear, remove the saucepan immediately from heat and whisk sauce well; add 3 to 4 cubes of butter off heat, whisking constantly. When temperature of sauce drops again to warm, return to low heat and continue adding butter cubes. Whisk continuously until desired thickness is achieved. 4. Strain sauce if desired. Taste and add salt and pepper, if needed. Serve sauce as soon as possible. It can be kept warm in saucepan if set on a rack above a pan of warm water, but it must be whisked frequently to prevent separation and the temperature must be kept constant. It can also be kept warm in a thermos. Season the paua lightly with salt and white pepper, dredge in flour and dip in beaten egg. SautÃ© quickly in hot clarified butter for 30 - 45 seconds each side. Spoon sauce onto plate, top with paua. Garnish with a tomato rose and dill sprig. Serves 2. Clean live paua and cut into 6-8 pieces each. Reserve shells. Mix cut paua with the sauce and replace in the shells. Preheat oven to 450 degrees. Bake paua 7-8 minutes. Top should be brown. Place shell on plate and garnish with fresh lemon or lime. Serve hot. This also works well with calamari. Rinse and dry lettuce, arugula and radicchio. Discard mushroom stems and slice tops in thin vertical slices. Rinse and dry pea pods. 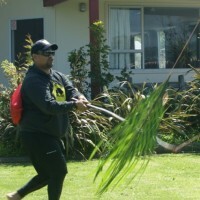 Remove paua from shells, using handle of heavy spoon to break muscle attachments. Reserve shells. Clean paua well, discarding undesirable parts. Clean shells thoroughly, dry and set aside. Using meat slicer, slice paua muscle crosswise into tissue thin pieces. If paua can't be sliced tissue thin, slice thin as possible and pound each slice on flat surface with mallet or flat end of cleaver until tender and almost transparent but not shredded. Combine juice of 1 lime, 1 tablespoon grated ginger and grind or two of fresh pepper in bowl. Add paua slices and toss to coat well. Marinate 15 to 20 minutes, stirring occasionally. Combine remaining lime juice, remaining ginger, vinegar, soy sauce and 3 tablespoons olive oil in small bowl. Tear lettuce, arugula and radicchio into coarse pieces and place in large bowl. Toss with dressing oil. Arrange greens in paua shells or on serving plates. Set aside. Heat remaining 1 tablespoon olive oil in skillet or autÃ© pan, add mushrooms and peas and season to taste with salt and pepper. Stir fry briefly, just until peas turn bright green. Remove from heat and toss to mix well. Pile hot mixture on top of greens in paua shells.